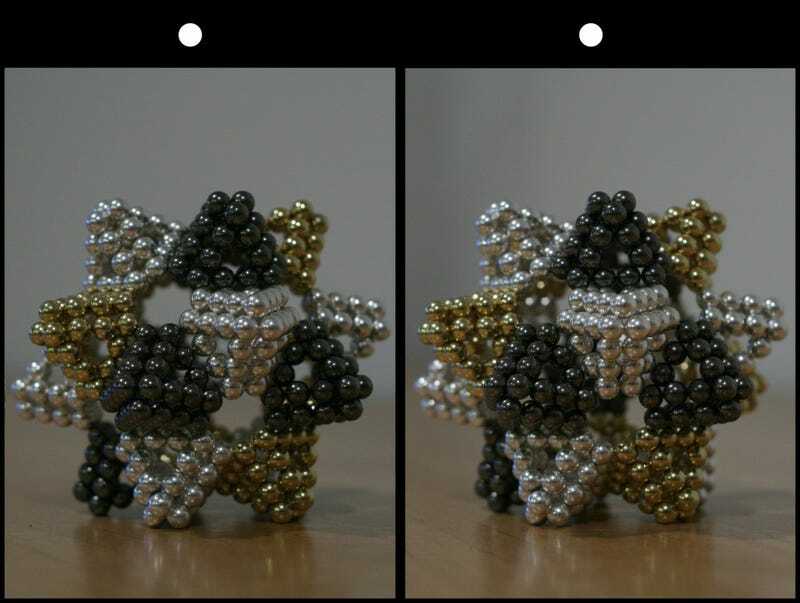 Got my bucky balls a month or two ago, have been a little disappointed by the pictures I take because it's hard to see all the depth, thought this would be a good way to fix that problem! Equipment: Canon 450D with a Loreo Lens In A Cap 3D lens. 1/60 at f22 and ISO 400. I shot in raw, converted with Digital Photo Professional, got StereoPhoto Maker to adjust the 3D image and create the boarder, then Photoshop to tweak and add the circles. I've been interested in 3D photography for a while, and have long been hoping that this would show up as a Gizmodo contest. A little while ago an ebay saved search found one of these Loreo lenses, and I just had to take the opportunity. Some people complain about the quality of the lens, but I've been totally satisfied. It's really good to have even when shooting static scenes such at this, because the smallest amount of wind can cause problems aligning the branches using multiple shots. The weather in England has been quite erratic lately, and I thought I'd take the opportunity to get some nice snow shots. The lighting wasn't right on the day for subjects with a really deep 3D effect, but I think that scenes like this with some subtle depth can look really good. I took this photo 12-16-2010 a few hours before going to the TRON Legacy Opening (which Rocked... I give it 4.5 stars... only thing it was missing was BIT). My Original Plan was to ask the people at the Theatre if I could stay afterwards and have them shut off the lights in the lobby so I could do some Open Shuttered "Light Paintings" (Leaving the Camera Shutters Opened) for the photo near the Giant Light Cycle they had on display when I bought my Tickets a few weeks ago. The Cycle wasn't there any more though. I snapped This Photo while getting Tea with My Friend (Pictured). I snapped another Photo at the Fountain outside of the Tea Shop, and when I found out the LightCycle was no longer at the theatre I spent a considerable amount of time getting a decent light painting in my bedroom. Ultimately when I was done with the Light Painting, I "Stereo'd" the previous images... and decided I liked the Tea Shot one better than the Silly Light Painting I'd spent so much time on. I'm not a professional photographer by any stretch, and it's not uncommon for me to experiment a lot before I get a shot that I find acceptable. The Tea Shop Pic was taken using Two PointNShoot Canon Powershot SD750s mounted on a horizontal Stereo Bar side by side, and Triggered Simultaneously with a USB Trigger that I found plans for on the Internet, and a Hacked version of the Canon Firmware that Allows the Voltage from the Trigger to Trip the Cameras. If anyone is interested... I posted a blog about my 3D process here: http://eyebender.com/2010/12/how-do-i-make-3d-photographs/ with links to wiring diagrams for the Trigger, and the Firmare Hacks. Because Light was low, and I can't manually adjust Aperture Settings, and didn't have a Tripod, and hate taking shots above ISO 200, I set the Timer on them both for 2 seconds so after triggering them I could try to keep steady. I shot this using my Canon EOS REBEL T2i with the Canon 18-135mm lens. The shot was taken on manual mode with a shutter speed of 1/4s and an aperture of f/5.6 at a focal length of 85.0mm. The ISO was set to 800 since the shot was taken in my dimly lit bedroom. I went into the challenge wanting to capture an object that was close enough where viewing normally would cause the eyes to cross. I positioned the subject on the chest at the end of my bed and setup the two shots as I would any other macro shot. It was important for me to get the DOF right to achieve the affect of looking at something right in front of your nose. I didn't play too much with the shot; a coworker and I have promised to start participating in shooting challenges for weeks now (this is my first). So I decided not to put *too* much thought and just start shooting as to avoid procrastination! Setup: Sponge Bob set on a DIY studio. These are some raku vases and a fancy glass art plate that I have in my house. I set them up in a corner of my livingroom on glass-top tables. To take the pictures I clamped a carpenter's level on top of my tripod, and adjusted until level. Then I put my camera on the level, took the left picture, slid my camera along the level 4 inches and took the right picture. Pictures taken with a Canon Powershot S90, 1/60 second exposure at f/3.2, ISO 800. Pictures aligned and adjusted in Paint.NET. This is a shot of dressmaker's forms in storage. Ordinarily I've found these to be a bit disturbing on their own; shooting them in the darkened room - illuminated solely by a Maglite flashlight - only heightened their imposing quality. I'd originally had entirely different ideas for this shooting challenge, but I couldn't resist trying these as a quick experiment. Once I assembled the images in PS, I couldn't help but feel creeped out by their 'Silent Hill' vibe! When i saw this contest i jumped at it because i alway miss these photograph contests. Now i know i dont have much talent so I'm just doing this for the fun of it. I tried a couple of things like a camera, big bottle of GermX but went with the car because i think it has the best 3d effect. Must have got the convergence right or something. Also funny finding an article on this because i just found out about this way of viewing 3d, been doing a lot of searching because i dont own a 3d tv. This photo was taken with a panasonic tm700 love, love this camcorder so much i bought two and thinking of doing 3d video as soon as i construct a beam splitter rig. I also want to do hdr video. To answer your question, yes... the cookies are as good as they look. Santa won't be disappointed. This is my first submission! I knew I wanted Lego on it, and two objects in different planes made sense, so I placed some strings to attach the ship to a lamp, and some wax on the clone's foot to make it stand at the right position (both harder than I thought), and a poster as the background. I like the depth on the clone's hand and helmet :). Actually, I think they're gonna stay like that for a couple of days over the desk. Canon Rebel T2i, 18-55mm f/22, 30", ISO-100. This is my first Christmas away from home, and decided to buy a tree (the Charlie Brown one). I figured the sparse branches would make for a good 3D effect. Turned off all the lights in my room, plugged in the Christmas lights, and used a tripod to keep the camera level while moving it. Shot with a Canon Rebel XSi and the 18-55mm kit lens reverse mounted @ 35mm, ISO 200, Shutter Speed 1/60, Aperture f/16. I just wanted to see if I could get the effect to work on a macro shot. I didn't use a tripod. I just rested my hands on the table and used the focus points in the viewfinder as guides to make sure the horizontal alignment was the same in both shots. I shot other poses and angles I preferred, but this one created the best 3D effect. It was difficult trying to get enough light for working with such a small aperture while keeping the ISO low, but i think I found the best possible balance for the amount of light I had to work with (two desk lamps). After following Giz's photo contests for almost a year now, I finally have the resources (and the stones) to give one a try. I didn't plan the shot very well because it was 15 degrees outside and I went to shoot during a passing period at one of the most walked-through sites on campus. I waited it out, then this couple came and started playing around on the Columns, so I waited more. It was cold. Anyway, all that time gave me an opportunity to line up the shots and get some samples. I quickly found that portrait shots worked better for combining the images with your eyes. And finally I had about 3 minutes where no one was around and I got some good, usable photographs. All photo editing (straightening/cropping) was done in iPhoto '11. I actually used Keynote to combine the shots together which also allowed me to instant-alpha-out the (distractingly infinite) background sky. This is what makes it look like the pictures were taken at night. And doesn't the dot make for a great moon when you cross your eyes!? The columns are the remnants of Academic Hall which was the main administrative building of MU (founded 1839). It was going to be the first building on our campus with electric lighting until it burnt down in 1892... due to an electrical fire. They are the staple image of the University of Missouri and are the 3rd most photographed site in the state of Missouri; the Gateway Arch in St. Louis being first, and the fountains on The Plaza in Kansas City coming in second. For this shot I knew I had to dig deep into my childhood while also adding some twenty-first century style. I started looking around my hose to figure out what to do, and then I remembered that I had a box of toys from way back in the basement. I went through if finding many different forms of Batman and Turtle characters and then I saw him, The Penguin (this is actually the first Penguin action figure that I ever purchased as a kid), I knew at that moment this was the basis of the shot, along with Quagmire/Family Guy being his point of his mayhem and destruction. I enjoy Family Guy but there is know way that it can ever compete with something as original as a Batman cartoon. How I achieved this shot was with a black piece of fabric that I found in the basement, a couple lamps that I rigged as a direct light source and a Wii game box(Mario Bros.) for my tripod. I knew that I wanted the figures to be the absolute focal point of the shoe and that I didn't want anything besides their activity to be a thought. I only had one camera, and no stand or whatever, so I just imagined a line on the ground (or just in the air, depening on the eye-eye distance I was going for) and moved on that line (moved the camera in the air). Focusing always on the same imaginary point on the model I then would take the pictures. Of one model I would take from 2 to 53 pictures, at different angles and distances. Later, at home, I would look which one where good, and produced the best 3D effect when combined and placed them in the template I've made. First I never thought about competing in the shooting challange, especially with such a camera, but after I fixed the header picture (read comment by ‘GregtheMad') I kinda got interested. So I just took the camera and walked through vienna, looking for the right models. On that day I took 220 pictures, what resulted in only 11 sterescopic pictures. The next day I walked into a local museum (Kunsthistorisches Museum Wien to be precise). Around 160 pictures later I was done with most of the art and returned to the main hall. I already took pictures of the christmastree there (one from the top floor, through a hole in the floor across 2 levels, awesome shot ... the eye-eye distance was bad ... ). I made around 20 pictures of the whole tree, from two distances. All sucked, but I didn't knew that at that point. One last thing I wanted to do was a shot of one of the orbs. Originaly I wanted a clear one, but I worried about my reflection, so I took a blured one. Those 2 pictures where the last I took that day. After I created the Stereograms I looked through the 22 results. Some where quite good, like the Napoleon on his Horse statue, or the girl statue that looks you into the eyes. But I took the orb because it had some good 3D effects, good colors and after all ... its Christmas. So much for the story in a few sentences, you can shorten it if you want. For my first ever contest entry I thought hard about what I wanted to photograph to make a stereogram and decided Legos were a good choice. At first I thought of doing a parody of Saddam Hussein's statue being torn down, but instead with a Darth Vader bobble head being torn down by two Lego Imperial Speeder Bikes but it became too complicated so I just reduced it down to just one Speeder Bike. I didn't have enough light in my room so I bought a new light to put over the Legos and took the pictures with my Droid X. After looking at about 12 different sets I chose my final photos and put them in together using Microsoft Paint on Windows 7. For this shot I wanted to use picture frames as windows into different scenes. So I took three 3D pictures and printed them all out (6 pictures in total, 3 left, 3 right). I used a Nikon D90 set to Automatic for those three shots, using a book propped up against some winter boots as the backdrop. I then took the 3 left pictures and placed them in their frames and put the frames on the desk. I took the first picture with the same D90, but set without the flash, so it wouldn't cause glare on the glass in the frame, the only light source was the lamp. I then marked where each frame was and replaced the left pictures with the right ones. I then moved the tripod slightly to the right and took the second picture. The result is one I'm really proud of, and my idea really worked, each picture frame appears to be a window into the scene of another 3D picture. No post was done other than some minor cropping, resizing, and adding the border. Taken with Nikon D40 at 18mm on a tripod. Framing was done using powerpoint and saving the slide as a jpeg. This is my 3D take on "transparent Desktop". To get this stereogram I actually had to take four shots. First was the left and right with the laptop closed, so that I could get the lights and "3D" letters as a wallpaper for each POV. Having saved the first two shots to the laptop, I then took another left and right with the laptop open, displaying those previous left and right images carefully cropped and aligned for the POV. Nothing was done in Photoshop except putting the final two images together and inserting the focus dots. I liked the black contour of it and wondered how it would look in stereo. Camera Olympus e520, kit lens, iso 800. My Wife had bought these lillies at the market and had just cut them and put them in the vase. I first started to move the tripod and camera for each shot but that proved to be less accurate than moving the model so the "Left" shot I moved the vase about 5 cm right and shot again. Nikon D90, ISO 200, 2 seconds at f13 (used the hight apature to get a deep DOF). Nikon 50mm 1.4g lens, no external lighting, only ambient. Used a shutter release and there it is. Best viewed at about 1 meter or more away from the screen, otherwise it is never completely clear, well for me anyways. in the town square all lit up for Christmas. (Partly out of necessity. looking twice as sharp and more detailed than either individual picture. distance takes longer than I have patience for. Technical: Fuji FinePix F20 (6MP). I used a Nikon D90 on a tripod with the 18-55 (kit) lenses, F11 and 6s of sutter speed. As soon as I saw the chalenge I knew I had to shoot my christmas tree. I know that you will recieve tons of photos with christmas trees on it, but it just looks so good! I love stereograms and I had fun taking the shots. After denying that I would need a tripod (which I don't own) as I shot a few scenes outside, I decided to try something that had a built-in system to stabilize and move my camera. This image is of a foosball table. My camera is resting on the bar used to track the score of the game (see the other one on the opposite end of the table). I rested my camera on this bar and then slid the camera back and forth until I found the right distance between the two shots for the ideal stereogram. After experimenting, I threw the photos into Lightroom for minor color/distortion corrections and placed the photos on the black background in Photoshop. It's been rainy this week, otherwise I would have done one of the mountains. My motherboard was the next logical choice. My younger brother, Derek, held a reflector for the flash. Nikon D50 18-55mm lens. Settings were 18mm f/22 1/250 sec. Since the aperture was stopped down so much my flash had to fire long enough that I got a fan blur, which makes it look a lot cooler. The processor is an i5 750 and I didn't show my graphics card because it's only a Nvidia 9500 GT. Some friends showed up to have a few beers tonight, and after they left I've taken a few shots of some empty beer cans for this challenge, instead of what I've carefully planned. As I've never been able to see stereograms, I had to ask my girlfriend to check if this one worked, but I'm not able to wake her up in the moment, so I've been crossing my eyes in front of this screen for 10 minutes and I guess I've seen 3D for a millisecond, and that's enough for me. Shot with a Canon T2i, 50mm 1.4 lens, open to 2.0, 1/40 sec, ISO 800. Tonight I only had my notebook available, so I've done this in GIMP. After some snow in the UK over the weekend I decided to take advantage of the picturesque conditions. It was late afternoon and already getting dark and therefore I used a tripod and a relatively long exposure (2.5s). Unfortunately I didn't realise that in the left eye shot a car went past in the background leaving a streak of light, so I had to Photoshop that out. I used a Canon EOS 550d with the kit 18-55mm lens at the wide end with ISO 100 and f/5.6. This was shot with a pair of Canon G7's synchronized with SDM. The exposure was 1/250 at f/4 and ISO 80. This is Bella, our Turkish Angora (from Ecuador) who is asking Santa for a present, specifically more turkey. I enticed her onto the table with some yummy sliced Butterball turkey. She's looking up at me for another bite. Alas, all it took was one slice to get the shot. Canon T2i, ISO 400, flash, 1/60. dinosaur with an odd looking box. process and was not digitized until scanned in for email submission. Photo was originally taken with a Canon 5D Mark II with a 35mm 1.4L lens. I decided to try and manipulate an existing photo to simulate 3D. I separated the layers so I could easily shift objects left and right to create the depth. The tricky part about the model was to use lots of little Liquify effects to give her depth in certain parts of the body. One image stayed in its original form while the duplicate was the heavily modified image. I had to use the resources I had at hand in my cubicle. I wanted darker materials for the set, so I scrounged up two keyboards for the trench walls and some pages from an old fractal calendar for the rest of the background. The post processing was done with GIMP. It took about an hour to complete… all on my lunch break, of course. OK guys, I was waiting for this one for quite a while:)) I took the pictures with my Nokia 6300, I edited them using the I'm feeling lucky option from Google Picasa, and then I glued them together using a software called Stereo Photo Maker. At first I assumed that the only way to see 3D images was with the help of some sort of glasses, and you can imagine my surprise and joy in the same time, when I heard about the cross-eye technique. This image is the best one I made so far. Hope you enjoy it!! !